Figure A. Alexa Fluor 647 conjugated Mouse anti Rat CD8 ( MCA48A647 ) and Alexa Fluor 488 conjugated Mouse IgG1 isotype control ( MCA1209A488 ). Figure B. Alexa Fluor 647 conjugated Mouse anti Rat CD8 ( MCA48A647 ) and Alexa Fluor 488 conjugated Mouse anti Rat CD4 ( MCA55A488 ). All experiments performed on red cell lysed rat blood gated on lymphoid cells in the presence of 10% human serum. Data acquired on the ZE5 Cell Analyzer. Formalin-fixed and paraffin-embedded rat lung labeled with Anti-CD4 Polyclonal Antibody, Unconjugated (ABIN671376) 1:200, overnight at 4°C, The secondary antibody was Goat Anti-Rabbit IgG, Cy3 conjugated used at 1:200 dilution for 40 minutes at 37°C. Immunocytochemistry/Immunofluorescence: CD4 Antibody [NBP1-19371] - CD4 antibody was tested in Jurkat cells with Dylight 488 (green). Nuclei were counterstained with DAPI (blue). Simple Western: CD4 Antibody [NBP1-19371] - Simple Western lane view shows a specific band for CD4 in 0.5 mg/ml of HeLa lysate. This experiment was performed under reducing conditions using the 12-230 kDa separation system. 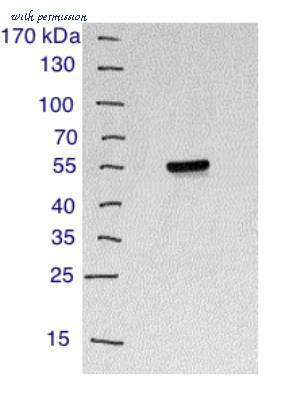 Western Blot: CD4 Antibody [NBP1-19371] - Mouse spleen, 25ug total protein. Image from verified customer review. Flow (Cell Surface): CD4 Antibody (W3/25) [NB100-64988] - Rat Splenocytes were stained with NB100-64988 (blue) and a matched isotype control NBP2-27287 (orange). Cells were incubated in an antibody dilution of 1 ug/mL for 20 minutes at room temperature. The antibodies were directly conjugated to Alex Fluor 488. 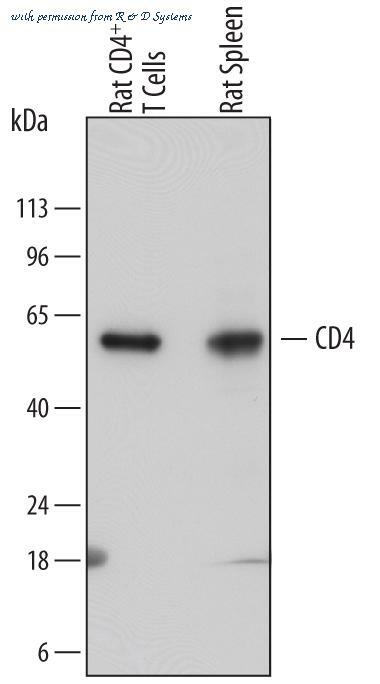 The CD4 antibody from Proteintech is a rabbit polyclonal antibody to a recombinant protein of human CD4. This antibody recognizes human,mouse,rat,pig antigen. 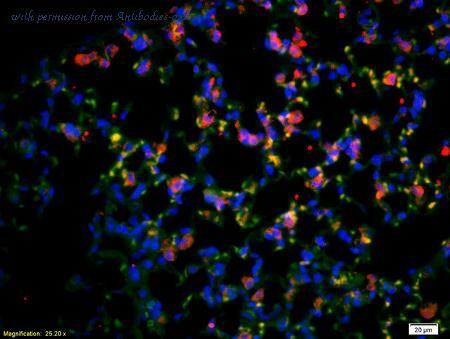 The CD4 antibody has been validated for the following applications: ELISA, IHC, IP, WB analysis. 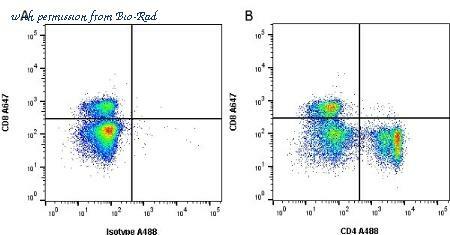 Flow cytometric analysis of mouse splenocytes Cell using CD4 antibody. 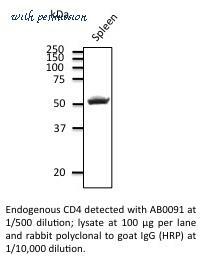 Western blot analysis of 293T cell lysate using CD4 antibody. 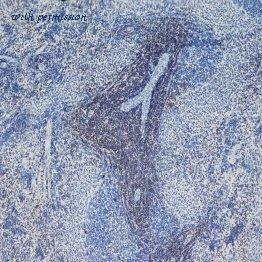 Immunohistochemical staining of mouse lymph tissueoma tissue using CD4 antibody. Detection of Rat CD4 by Western Blot. Western blot shows lysates of rat spleen tissue and rat CD4+ T Cells. PVDF membrane was probed with 0.2 ╡g/mL of Mouse Anti-Rat CD4 Monoclonal Antibody (Catalog # MAB6439) followed by HRP-conjugated Anti-Mouse IgG Secondary Antibody (Catalog # HAF018 ). 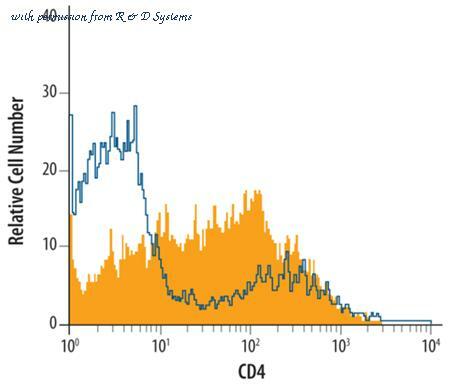 A specific band was detected for CD4 at approximately 55 kDa (as indicated). This experiment was conducted under reducing conditions and using Immunoblot Buffer Group 1 . Detection of CD4 in Cotton Rat Splenocytes by Flow Cytometry. Cotton rat splenocytes were stained with Mouse Anti-Cotton Rat CD4 Monoclonal Antibody (Catalog # MAB6676, filled histogram) or isotype control antibody (Catalog # MAB0041, open histogram), followed by Allophycocyanin-conjugated Anti-Mouse IgG Secondary Antibody (Catalog # F0101B ). 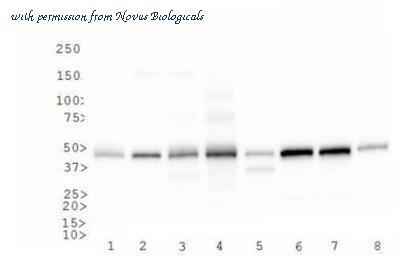 Detection of Rat CD4 by Western Blot. Western blot shows lysates of rat CD4+ T cells and rat spleen tissue. 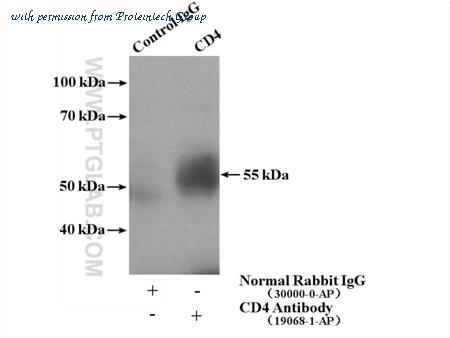 PVDF membrane was probed with 1 ╡g/mL of Sheep Anti-Rat CD4 Antigen Affinity-purified Polyclonal Antibody (Catalog # AF6439) followed by HRP-conjugated Anti-Sheep IgG Secondary Antibody (Catalog # HAF016 ). 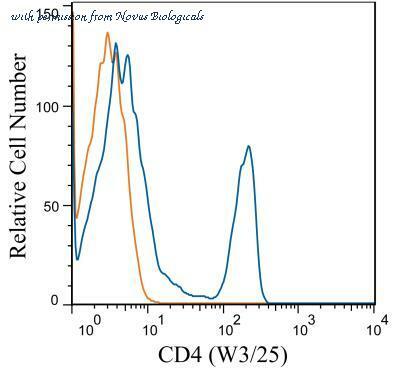 A specific band was detected for CD4 at approximately 55 kDa (as indicated). This experiment was conducted under reducing conditions and using Immunoblot Buffer Group 1 .